After looking like comfortably claiming top spot on the BBL08 ladder, Hobart Hurricanes were on the end of a surprising loss against Adelaide Strikers as they gave the chasing pack an opportunity of overhauling them. The Hurricanes will now need a win from one of their final two matches in order to guarantee a home semi-final following the seven-wicket loss and face a tough contest against Melbourne Renegades who have a good head-to-head record against them. Hobart have finally secured a replacement for the injured Tymal Mills in the form of Afghanistan leg-spinner Qais Ahmad and he could come straight into the team for this crucial game at the top of the ladder. Melbourne Renegades continued their good run of form as they claimed their third consecutive win when they faced Sydney Thunder in their last match and with that win, they kept alive their hopes of a home semi-final. The Renegades were again thankful for their bowling unit as they skittled the Thunder for 113 in the 27-run win which was the second game in a row that they managed to bowl their opponents out. With eight days between games, the Renegades have the chance to freshen their squad up ahead of the important run-in and that could lead to veteran Cameron White overcoming a hamstring problem. Melbourne Renegades head into this contest on the back of a three-game winning streak in a game they must win in order to give themselves a chance of a home semi-final. 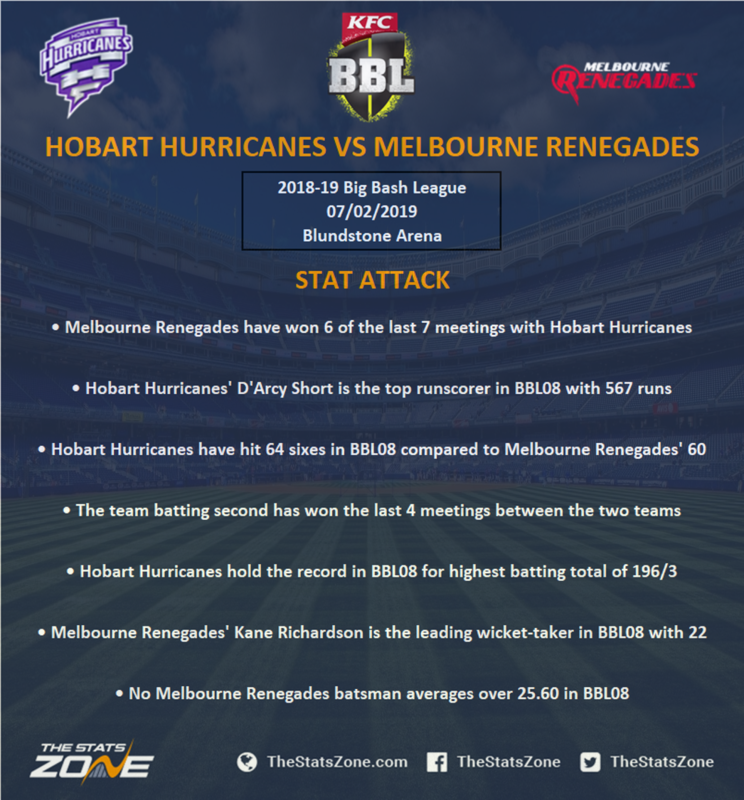 They face a Hobart Hurricanes outfit that they got the better of earlier in the competition and have a favourable all-time record against. The Hurricanes suffered a shock defeat last time out and could have become complacent thinking they were secure at the top of the ladder. However, that position is now under threat and the Renegades can place them under even more pressure by turning them over here.